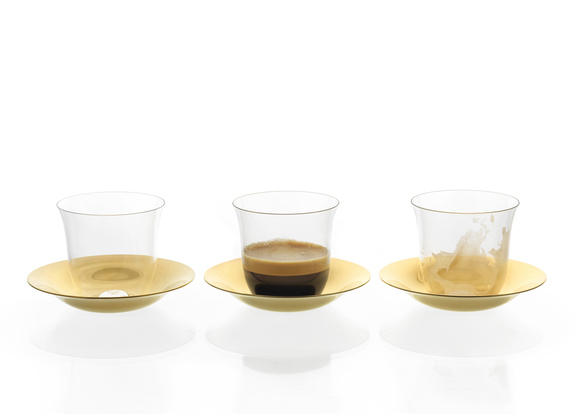 Inspired both by middle and far eastern tea cultures, this coffee glass and saucer celebrates positive globalisation. It is an extension of Josef Hoffmann’s classic Patrician series from 1917. The design focuses on Lobmeyr‘s core materials: crystal glass and gilded brass. Simple and immediate, you feel the warmth. The golden saucer reflects your coffee with a warm glow. The shape opens up gracefully towards the top like a blossom, which also makes it pleasant to hold. For people who celebrate everyday life.